Looking for a new Romantic Intrigue? Then you will love the Turchetta’s. You met them in both the Betting On You Series as well as Barrington Billionaires Series. Now it is time for an up close look into their lives. Rafe Turchetta may have retired from the Air Force, but his life was still dedicated to fighting the injustice of the world. There was one offense that went so wrong, and it will haunt him, as it continues to destroy him on the inside. Deanna Glenn was being tortured by a tragedy, one that she couldn’t share with anyone. Time was running out and she needed the lies to cease before she started to believe them herself. Healing meant returning to where it all went horribly wrong years ago. For Deanna she needed to take on a new identity. For Rafe, that meant doing whatever he needed to in order to get her to speak the truth. 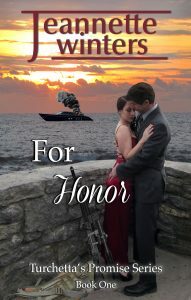 When danger rears its ugly head will Rafe follow his heart and protect Deanna even if it means never learning the truth? Or will Deanna sacrifice her happiness and expose it all? Storytelling was pasted down from her grandfather and mother. Jeannette caught the bug at a very young age. If she didn’t have her head in a book, then she was off somewhere with a notebook, jotting down stories of what she would write if one day she became an author. Although the notebook may have vanished, the stories are still vivid and waiting for the right time to be told. As she approached a milestone birthday in 2015, she decided to take her passion of writing and blend it with her desire to continue to help others. As she writes her stories, she hopes they touch someone’s life. Within the layers of the romance, the foundation remains throughout and is one that is dear to her; make a difference in someone’s life each day! In 2016 she met someone who encouraged her push herself even further and try her hand at spicy intrigue. One year later she has four books in this new series and each one pushing her limits just a bit further. Like the wind, Jeannette’s life changed directions several times over the years, yet one constant remains: her desire to leave this Earth a little better than when she entered it as she tries to live by these words, Make your mark on the world today as your acts of kindness is all anyone will remember in years to come!